In your turns, ready, go! Will you be skilled enough to build the maximum number of laps before the end of the hourglass? Will your adversaries let you do it, or will you see your dear works crumble under the repeated assaults of their catapults? In Kaboum, you are in turn the master builder whose objective is to build towers more or less complicated to gain a maximum of victory points. But beware your turns are not counted unless they stay up at the end of the hourglass. During your turn, other players will have a catapult and limited ammo that they will use to sabotage your work. 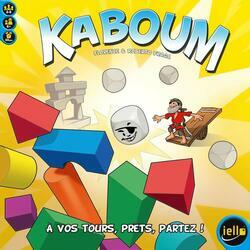 Kaboum is a fun and family game that will reward the most skilled builder and the most accurate shooter.